For me, summer is equal parts fighting acne and pigmentation (more to come on the latter in a different post) and hydrating the skin, as sun and swim completely dehydrate the complexion. I look for products that won’t exacerbate any of my skin concerns and, hopefully, will actually work to improve them. Dr. Barbara Sturm Enzyme Cleanser – I’m a huge fan of the Barbara Sturm Cleanser, which is literally the most gentle foam cleanser that removes the day, but sometimes my skin needs a bit more kick. That’s when I opt for the Enzyme Cleanser. It’s a powder that turns into a light foam when activated with water. The chemical-free exfoliation leaves my complexion clean and glowing (although I always use this as a second cleanse). During the summer, it’s so important to gently exfoliate the skin to remove sweat and debris. Just remember to always wear an SPF after as the skin becomes more sensitive to sun. Drunk Elephant Shaba Complex Eye Serum – I’m all about eye serums and gels (I will be dedicating an entire post to this soon), and the Drunk Elephant Eye Serum is super gentle, nourishing, and lightweight, so it won’t leave a mega-oily residue that inevitably seeps down the eye area, even getting into the eye. Herbivore Botanicals Lapis Facial Oil + Blue Tansy Clarifying Face Mask – Could not love these two products more for gentle, acne-fighting, complexion clearing, texture resurfacing. Read my in-depth review on this duo here. Glossier Super Pure Serum – I’ve written about this serum before, and I’m still feeling it. It’s super light and it really calms active acne redness. I spot treat acne patches with the serum. Zinc is one of my favorite acne ingredients. SkinCeuticals H.A. Intensifier – I’m a huge fan of hyaluronic acid. 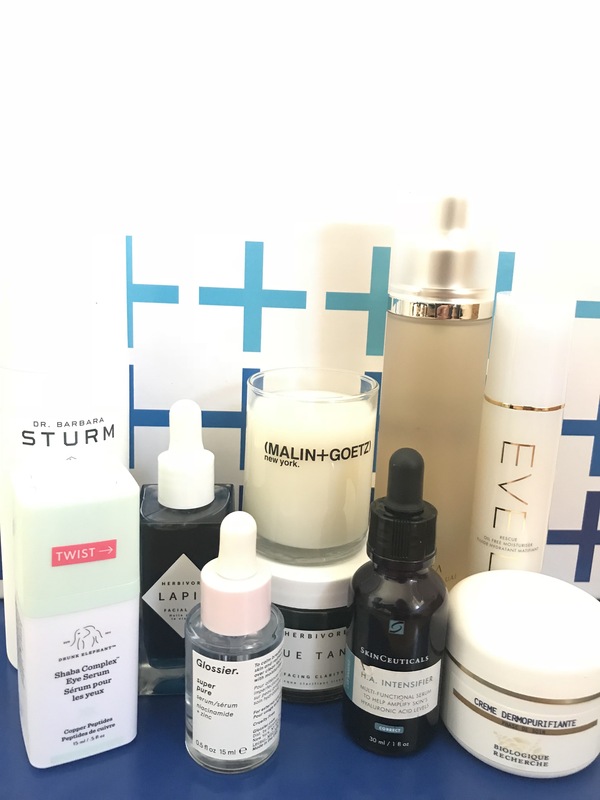 For pure HA, I use Barbara Sturm Hyaluronic Acid Serum (not pictured), but I’m loving this SkinCeuticals rendition as it contains other ingredients that are great for fighting acne and leaving the complexion clear and plump. Shiffa Floral Facial Toner – I love a mist in summer months. It feels soothing and hydrating, and it’s like a treat for the skin. This one smells like roses and the spray is legit (definitely more than a mist). I’ve been using it all over my body, too. Eve Lom Rescue Oil-Free Moisturizer – Every oily/ acne skin type needs an oil-free moisturizer for summer. This one is a new find that I’ve been really enjoying. It’s lightweight and gentle to the skin. Biologique Recherche Creme Dermopurifiante – I’m obsessed with the Biologique line and, after receiving a fabulous facial with the products, I’ve gone from just a Lotion P50 lover to a serious fan of this moisturizer for reactive skin. It’s not pretty, nor does it smell particularly amazing, but it gives great moisture without any breakouts, and it leaves my complexion hydrated — but not overly hydrated — for the entire day. I use this on top of the Lapis Facial Oil and before my SPF.